I always see an album cover as an extension of the album itself; the artists intentionally chose a visual component that they wanted to represent their music. When I look at this cover I think of the moon, cave paintings, and plants cells all packed together. All of these images are ancient, organic and an important part of our humanity. The Lebanese "A" Trio and now AMM duo team up in a release that channels that long-lasting energy. The "A" Trio is a group that is composed of Mazen Kerbaj on trumpet, Sharif Sehnaoui on acoustic guitar, and Raed Yassin on double bass. The AMM, now being sustained by veterans Eddie Prévost and John Tilbury, serve as partial mentors to the young improvisers. But thankfully this live recording is not just an example of a master-apprentice relationship, rather it's the joining of two different worlds through the power of improvised music. Tilbury and Prévost serve as a sort of enhanced rhythm section that provides a lot of interesting moments, yet the "A" Trio actually supplies the most flavor and substance throughout the whole piece. This isn't to discredit AMM; they perform fantastically, and I think they really bolster the performance of the other players. There's a real sense of cohesion and fluidity that is brought by these two clashing worlds, the East and West. Just recently released, this performance was over three years ago, completed without any cuts, overdubs, or use of electronics. This just provides further emphasis on the improvisational method of these musicians and helps us understand the development of their music in the moment. The beginning minutes of "Unholy Elisabeth" are evocative of a quiet night, with the full moon shining down and rain drops falling from leaves above. Tilbury's piano playing is soft and melodic, almost like nature's own improvised nursery rhyme. The general calmness of the music during this introduction can be viewed as either the calm before the storm, or the silent aftermath. Either way, one's anxiety can build up as only the sterile scraping of guitar strings is present. As more musicians join in the tension can truly be felt, while each instrument adds a vital layer to the music that are like gusts of wind felt on the ground and through the branches. During the first quarter of this fifty-one minute piece my attention was almost solely focused Tilbury's serene notes cutting through. The AMM members provide the most obvious instrumentation and sounds, but it may be hard at times to distinguish what instrument is being played. More accurately which instrument is being tested and operated on. The bowed bass is the framework on which all other sounds are being added onto, and there sure are a lot of sounds. I prefer the duos or trio sections within the piece that pop up; a few elements that serve as a playful back-and-forth between musicians. This facet, along with the organic nature of the instruments, makes for a very wild and raw exposition of sound. Mazen Kerbaj's trumpet is one of the most versatile instruments in the group; acting as a bubbling bog or a pleading prayer voice. The trumpet represents the human relationship with nature. We are always at its mercy but our connection to it is stronger than we think. The pauses in music and return to silence helps clear the mind and allows starting points that flesh out new ideas. Prévost's percussion style is scattered and muted to a degree, it's a hint at something sinister and underlying. About thirty-five minutes in, this playing is joined with steely strings and a beat which seems to be either finger tapping or airy breathing out of the trumpet. The trumpet exposes itself anyways and suddenly goes silent, only starting again with Tilbury's habitual peaceful playing. Kerbaj's playing turns into a true cry for help, an exasperated groan that is a last-ditch effort for an answer. Sharif Sehnaoui's guitar picking is pretty absent until near the end where he enters a mostly duo setting with Tilbury, as the vibrating trumpet serves as the background. Sehnaoui's playing is dusty and in an Eastern style, drawn out notes that sound like they've traveled across miles of sand dunes just to reach your ears. The trumpet moves forward and then everyone else joins in for one last burst of energy, just before dissipating into blowing sand. This uninterrupted live story is surely an adventurous treat, not only for the ears but for the mind. A prehistorical narrative is formed, concerning all humans and pointed towards the world around us. Including all the turmoil and peace that finds its way into our lives. It's puzzling as to why this was just released; either way it's an important release in the AMM catalog and a kindling agent to check out the rest of "A" Trio's releases. There's no doubt that a certain amount of clout is given to this release due to the inclusion of the AMM but besides the memorable playing of its members there is still a lot to absorb. Even in its improvisational style the "A" Trio brings it's Middle Eastern and Arabic music influences into the mix. There are hints of these melodies and playing styles that are projected onto their western instruments. 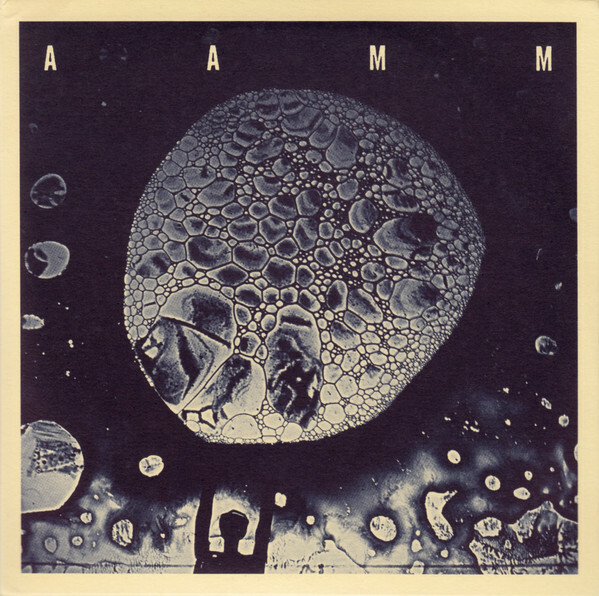 It adheres quite well with the playing of Prévost and Tilbury, to assist in creating a unique and interesting addition to the AMM discography. It's not as harsh as some might expect, and I might even recommend this as a starting point for someone looking to peep into the AMM catalog. I wish more collaborations like this would occur; people of completely different backgrounds coming together through similar medium in order to create compassionate, natural music. Thanks Kian: great review for an excellent album. Just as a note, I don't think this is actually a live recording, although it was recorded in the same space as the live performance. It was actually recorded the day before the Mikromusik festival performance. 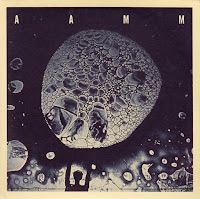 On the latter date, the performance was one set by AMM, one by the A-Trio, and then one set by AAMM. The last of those three sets was broadcast by Deutschlandfuk Kultur, and might still be available on their website as an MP3. It's definitely a different set than the CD release.